HIRE A BICYCLE for a month for a tenner. That’s Hackney council’s latest way to get more of the borough’s residents to take to the roads on two wheels. The deal, costing a total of £60,000, seems good value for users and taxpayers. Even better, at the end of the four weeks, you can buy the bike, at a discount through a loan scheme the council has set up and pay it off over six months. The council says the Cycle Loan Scheme bikes are good-quality men’s and women’s, in different sizes, as well as folders, for commuting and for leisure. Cycle training is provided and you can borrow a helmet, lock, lights and child seat at no charge. 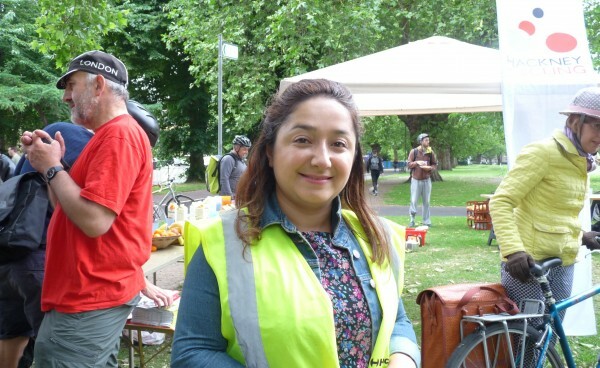 Hackney’s neighbourhoods councillor Feryal Demirci said the council was determined to get more people enjoying the health and economic benefits of cycling. puncture, they just get the bike to a bike shop and they don’t have to pay for repairs”. The scheme is based on similar projects in Greenwich and others run by Lewisham, Lambeth and Enfield councils. This year, Hackney council’s £60,000 version includes money from Transport for London and Section 106 planning gain (developers cough up some money for a social benefit). Cycle Experience won the contract by tender. Such a highly ambitious scheme – its launch pictured at top (supplied pic) – will require careful administration. If any northeast London council has that ability, it is probably Hackney. Let us hope it is up to the challenge.